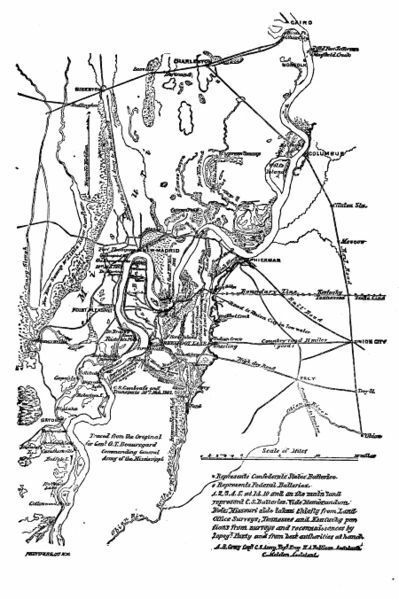 The Battle (also known as the Siege) of Island Number Ten was an engagement at the New Madrid or Kentucky Bend on the Mississippi River during the American Civil War, lasting from February 28 to April 8, 1862. The position, an island at the base of a tight double turn in the course of the river, was held by the Confederates from the early days of the war. 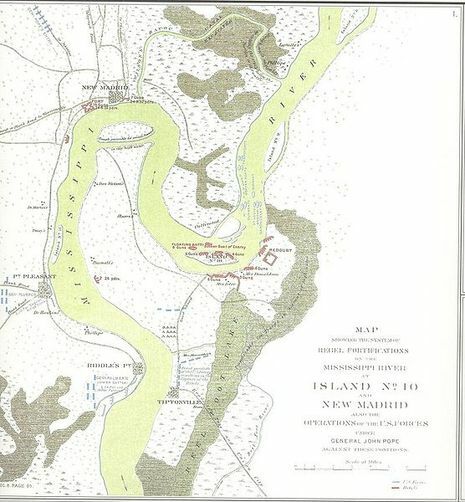 It was an excellent site to impede Union efforts to invade the South along the river, as vessels would have to approach the island bows on and then slow down to make the turns. Unfortunately for the defenders, it also had an innate weakness in that it depended on a single road for supplies and reinforcements, so that if an enemy force could cut that road, the garrison would be trapped. Union forces began the siege shortly after the Confederate Army abandoned their position at Columbus, Kentucky, in early March 1862. The first probes were made by the Union Army of the Mississippi under Brig. 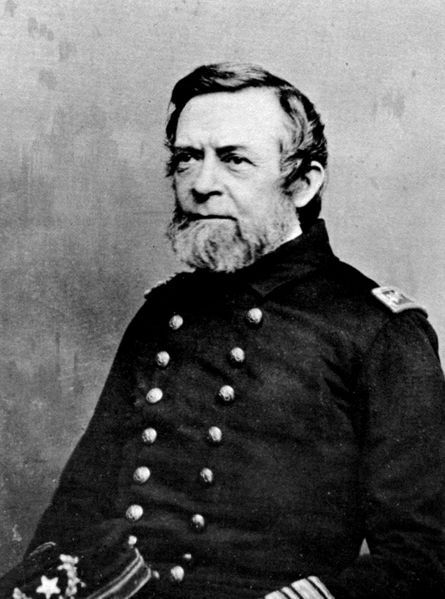 Gen. John Pope, which came overland through Missouri and occupied the town of Point Pleasant, Missouri, almost directly west of the island and south of New Madrid. From there, the Union army moved north and soon brought siege guns to bear on New Madrid. 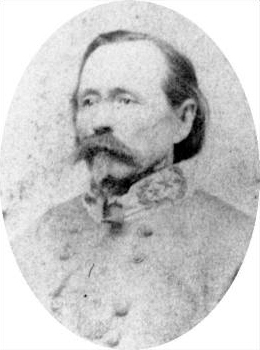 The Confederate commander, Brig. 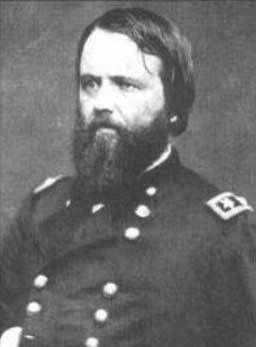 Gen. John P. McCown, decided to evacuate the town after enduring only one day of bombardment, removing most of his soldiers to Island No. 10 but abandoning much of his equipment, including his heavy artillery. 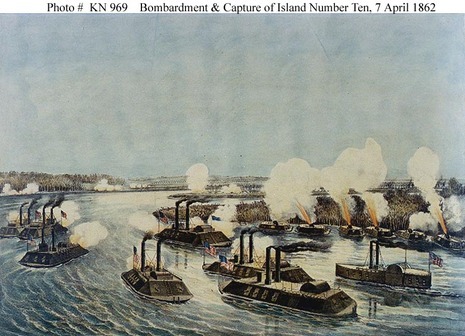 Two days after the fall of New Madrid, Union gunboats and mortar rafts came down to attack Island No. 10 from the river. For the next three weeks, the defenders on the island and in nearby supporting batteries were subjected to bombardment by the vessels, mostly carried out by the mortars. While this was going on, the army at New Madrid was digging a canal across the neck of land to the east of the town; several transports were sent to the Army of the Mississippi by way of the canal when it was finished, providing the army with the means of crossing the river and attacking the Confederate troops on the Tennessee side. Pope persuaded Flag Officer Andrew Hull Foote to send a gunboat past the batteries, to aid him in the river crossing by warding off any Southern gunboats, and by suppressing Rebel artillery fire at the point of attack. This was accomplished by USS Carondelet, under Commander Henry Walke, on the night of April 4, 1862. This was followed by USS Pittsburg, under Lieutenant Egbert Thompson two nights later. With the support of these two gunboats, Pope was able to send his army across the river and trap the Confederates who were trying to flee. Outnumbered at least three to one, they felt their cause was hopeless, and decided to surrender. At about the same time, the garrison who had remained at the island decided that resistance was futile for them as well, so they surrendered to Flag Officer Foote and the Union flotilla. The Union victory marked the first time the Confederate army lost a position on the Mississippi River in battle. The river was then open to the Union Navy as far as Fort Pillow, a short distance above Memphis. Only three weeks later, New Orleans fell to the Union fleet led by David G. Farragut, and the Confederacy was in danger of being cut in two along the line of the river. Battle of Island Number Ten, military engagement of the American Civil War, fought during the late winter and early spring of 1862 in and around Island Number Ten, in the Mississippi River, in northwestern Tennessee. In order to enter the lower Mississippi River, the Union forces found it necessary first to capture the island, which was heavily protected by Confederate troops. The fortifications consisted of land batteries on the island and on the opposite Tennessee shore and a floating battery off the coast of Island Number Ten. In April 1862 two Union gunboats reduced enemy shore batteries. Union troops, led by General John Pope, crossed the river south of the island and landed on it, thereby seizing the only avenue of escape of the Confederates. On April 7 the garrison, numbering some 7000 men, surrendered. Island Number Ten disappeared in the course of time as a result of the eroding action of the Mississippi River.